By Andrew Liszewski on 09/05/06 • Leave a comment! 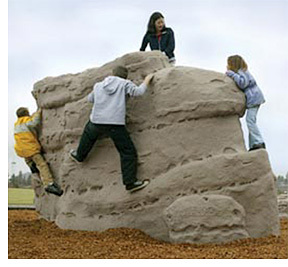 If you want your kids to build some real character in a hurry you’re going to want to forego those swingsets and jungle gyms in your backyard and instead have one of these Climbing Boulders installed. There are also smaller versions available for younger kids and the website claims installation will only take from 3 to 6 hours depending on the size. And even though the ‘Cliff Boulder’ weighs in at 1865 lbs (which the site honestly refers to as “amazingly lightweight”) you apparently don’t need to rent a crane to get it in place.